These are the most common electrical questions asked by our clients in the Middletown, Newark, Wilmington area. Contact us today at (302) 376-7967 so that we can discuss your electrical needs, since each electrical configuration and design is different we will study your case and provide an array of options. In which areas does EFS Electric Inc. provide service? 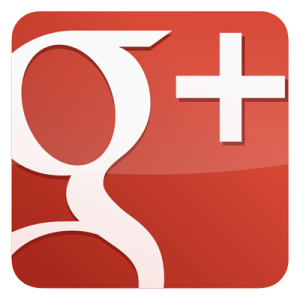 EFS Electric Inc. provides electrical services in Delaware and surrounding states. What is an electrical service panel upgrade? The utility company provides electrical service with underground or overhead conductors and each require different materials for replacement. See replaced items below. Overhead Service: Service entrance conductors from utility connection point to the meter pan and from the meter pan to the service panel, meter pan, service panel, breakers, installation of ground rod and all applicable bonding and grounding. Underground Service: Service entrance conductors from meter pan to the service panel, meter pan, service panel, breakers, installation of ground rod and all applicable bonding and grounding. Why should I consider upgrading my electrical service panel? Older homes still have their original 100 amp or even 60 amp service. If you’re looking to build an addition, remodel the kitchen, install a pool, hot tub or upgrade your HVAC system, your electrical panel may require additional space and additional amperage to provide sufficient power. Replacing your electrical panel will increase the available ampacity and provide the necessary space to install additional branch circuits. An upgraded service will ensure that your home meets national and local code requirements. This is especially important if you are trying to sell your home. As a standard, electrical panels can provide 100, 150 & 200 amps of power. Installation of 300, 400 & 600 amp services are available when larger loads require. 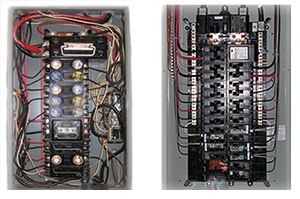 Electrical panels are typically installed in the garage or basement. Moisture may be present due to water entry from the outside or condensation. This moisture causes corrosion. Corrosion of electrical wires, breakers and equipment compromises their function and your safety. Signs of electrical failure are burned conductors, overheating (“hotspots”) at connection points and sounds of arcing. 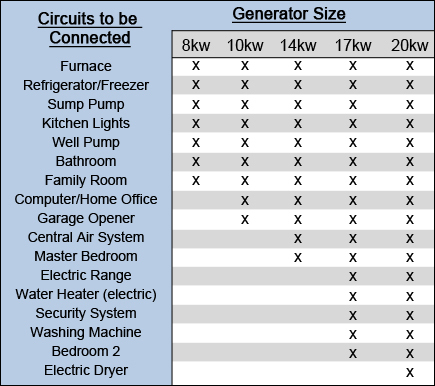 Should I consider purchasing a portable or standby generator? What should I consider powering with the generator? Should I consider having a whole house surge protector installed? Providing surge protection is like purchasing an insurance policy for your equipment/components connected to your electrical system. For a fraction of the cost to replace equipment you could provide protection. What types of surge protectors are available? Whole house surge protection (point-of-entry surge protectors) whole-house models would be installed at your main electrical panel. They would provide protection for the entire house from external surges. They can also provide protection against surges created by appliances within the house, but only when those surges reach the main electrical panel. Receptacle strips & wall mounted surge protection (point-of-use surge protectors) provides protection for one or more electronic devices at a specific location. The surge protector will provide protection to the devices plugged in by diverting the surge (energy) away from the electronic device. What type of surge protector is better? Some protection is better than no protection and you can't have too much protection. The point-of-use surge protector can provide protection for one or more devices power line, phone line, data line, cable TV, satellite dish and USB cord, in a specific location. The point-of-entry surge protector will provide protection for incoming electrical power as well as for your telephone and cable television lines for full protection. Because they can't intercept all surges, it's best to use a whole-house protector in conjunction with point-of-use protectors. What are some features that should be considered when purchasing a surge protector? Protect all lines - power line, phone line, data line, cable TV, satellite dish and USB cord. Select a surge protector that not only meets your needs today, but also has room for additional equipment to be added later. Select a surge protector with a warranty. Some manufactures warranties for surge protectors will cover replacement of your connected devices if the surge protector fails.